Remembering Maine Potato Harvests From Days Gone By. Special Offer: FREE Organic Red Russian Garlic. Wild Storm Surge at Thunderhole. Wood Prairie Family Farm Photos. Notable Quote: Fred Rogers on Comforting. New Wood Prairie Fall Catalog Now Appearing in Your Mail Box. In this Catalog cover photo -taken last Fall - Sarah Gerritsen holds a lunker 2-pounder Prairie Blush potato as her sister, Amy, looks on. Local schools here in Northern Maine close on Friday, September 14 for this year’s Potato Harvest Break, and that’s when we’ll begin “digging.” You’ll enjoy the next article which offers a glimpse into what it was like years ago for students to work as a “potato picker” on an Aroostook County potato farm. We’re hoping for dry weather from here on out until Aroostook’s potato crop is safely under cover in October. Wherever you are, we hope your yields are large and your harvests go well. Picking potatoes in Aroostook County. Cody Caron on the Martin Farm in St. Francis, Maine, 2015. As a kid, 69-year old John LaChance lived in Aroostook County, Maine, where schools closed every Fall for 'Potato Harvest Break.’ He and his classmates would work and earn spending money (typically used to buy clothes) by helping 'pick potatoes' for local farmers. John has penned a real-to-life memoir of one day from his potato-picking-past which recently posted in local Aroostook news publication Fiddlehead Focus. We think you'll find this piece well-worth reading. 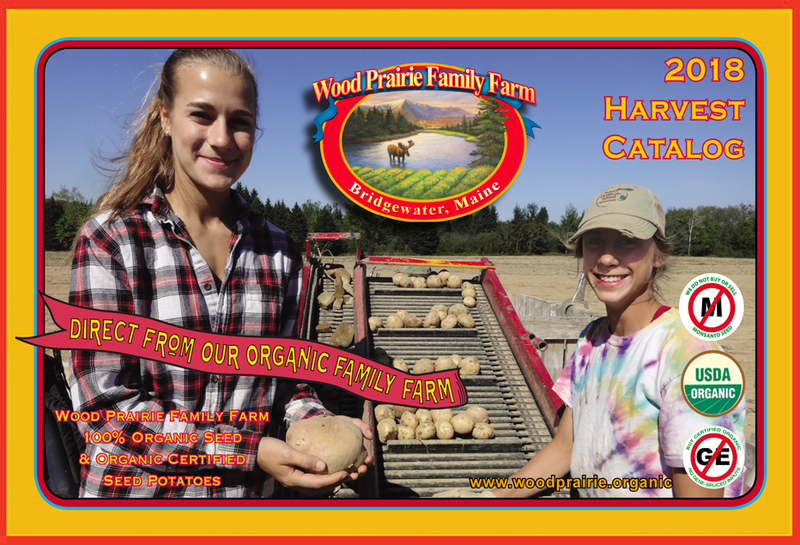 Wood Prairie Family Farm is located in the center of Maine’s Potato Empire, in the potato-farming town of Bridgewater. Our school district is made up of other small potato-farming communities. In a tradition dating back to WWII, local schools will yet again close down for the three-week 'Potato Harvest Break.’ Like all area farmers, we’ll be helped in our harvest by local students. Prior to WWII, schools up here went back into session in November after Potato Harvest was completed, and ended for the year in March mud-season before it became time to cut potato seed. After the war, Augusta conjured up the invention of a standardized state-wide 175-day school-year. Perhaps predictably, Aroostook County responded, maneuvered and in-time succeeded in getting a change in Maine State Law. The new legal accommodation allowed Aroostook schools to start up classes early in mid-August, and then close down a month later in what became known as Potato Harvest Break. Aroostook County has been raising potatoes for over 200 years and potatoes remain the single most important centering-point in our local culture. As Mr. LaChance's writing reveals the lessons learned from working Fall potato harvest took real effort and helped build character. The memories of a worthy tradition last a lifetime. All day, you follow on your knees behind the digger’s last dug rows, and you fill barrel after barrel. Seemingly addicted to the next number that follows the last number of the barrel you just filled, you tumble another basketful of potatoes into another worn barrel that is soon filled. And, taking off your muddy gloves, you proudly insert your red ticket number into the barrel cleft. Special Offer: FREE Organic Red Russian Garlic Seed. Garlic is one of those simple quality-of-life crops. Yes, technically, one could live without garlic but why would one want to since it’s so meal-changing and so easy to grow? For many years we’ve been supplying gardeners and eaters with our fresh Red Russian Garlic – use it with confidence as seed or for cooking purposes right now in your kitchen. Fall is the best time to plant this hardy Rocambole garlic for harvest next Summer. Garlic appreciates full fertility so consider adding a good organic fertilizer when growing your own garlic crop. Now earn a FREE 1 Lb. Sack of Organic Red Russian Garlic Seed (Value $29.95) when your next order totals just $99 or more. FREE Organic Red Russian Garlic Seed Offer ends 11:59 PM on Monday September 17. Please use Promo Code WPFF435. Your order and FREE Sack of Organic Red Russian Garlic Seed must ship by December 7, 2018. Offer may not be combined with other offers. Please order NOW! Click Here for Our Organic Wood Prairie Vegetable Seed. Organic Red Russian Garlic. Good for eating, good for planting in the Fall. Acadia National Park's Thunderhole. The mighty power of a Storm Surge. Thunderhole remains one of the major attractions at Acadia National Park along Maine’s rocky coast. For the last twenty years after we’re done planting and school lets out, our family has gone camping at Acadia where the breezes blow and there are no Black Flies in June. With all the justified concern this week over Hurricane Florence bearing down upon the Carolinas, we were reminded of this remarkable Thunderhole video (2:44) from last March. The rare video captured the impact of one powerful Winter storm surge on Thunderhole. It’s well-worth watching! 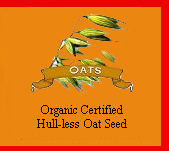 Click Here for Our Wood Prairie Certified Organic Cover Crop Seed. Harvesting Organic Dorinny Corn Seed on Wood Prairie Family Farm. In advance of rains forecast for this week, and after a nice dry spell, we harvested our crop of heirloom Organic Dorinny Sweet Corn Seed last Saturday. Here, Caleb is driving our 92-hp Oliver 1850 Diesel tractor. The tractor is pulling our New Idea 323 one-row Corn Picker. The Corn Picker plucks ears off the stalks, peels the papery husk off the ear, and using a conveyor deposits the husked ear into the trailing Gravity Wagon (look close and you will see an ear mid-air en route into the wagon). Caleb’s sister, Amy (in hunter-orange-hat), works as a gleaner, walking behind the wagon and collecting the odd ear left behind by the efficient Corn Picker. The green carpet underfoot is trampled down Organic Winter Rye we spun on during the last tractor cultivation in July. The cereal Rye had grown almost a foot high. Wagon Load of Dorinny Corn Cobs. This is a photo of field-run Organic Dorinny corn ears as they pile high into the Gravity Wagon. The ears will need to be completely de-husked, then dried, sorted, shelled, cleaned and graded. You may find the series of photos of our corn planting efforts from three months ago in the June 15, 2018, edition of the Wood Prairie Seed Piece. Megan Checking Dorinny Corn Ears Laid Out in Drying Trays. Homemade 3’ x 8’ drying trays - with half-inch hardware cloth bottoms - are stacked full with newly harvested ears of Organic Dorinny Sweet Corn Seed. This dry down phase will take a few weeks. The drying process is aided by three inexpensive window fans which blow upward through the trays of corn. Newly Re-Built Wisconsin Gas Engine. As Caleb has had time over the Summer, he has now finished completely rebuilding what was once the tired Wisconsin 4-cylinder engine in a Case Skid Steer Loader he bought last year for a bargain price. Caleb in His Shop Putting Finishing Touches on ‘New’ Case Skid Steer Loader. Finessing a stubborn tube-less tire that was reluctant to hold air, Caleb makes ready his ‘new’ Case Skid Steer. Now that he has the Skid Steer running, he’s tackling some jobs which have been backed up. Shoveling Manure With Skid Steer at Night. With flurries of insects artfully captured by the camera as spheres-of-light, Caleb works into the night cleaning manure out of the barn with his Skid Steer and loads the manure and bedding into our awaiting dump truck. This Fall, the manure will be hauled and spread on fields and then disked in. Then these same fields will be planted next year to Organic Seed Potatoes. Game Cam Captures Resident Black Bear. As corn ears begin to develop in our Organic Corn Seed production plots, we strategically place hidden Game Cams so we can monitor the ingress and egress of four-footed neighbors who may develop a hankering for organic corn. Here, our resident Black Bear –featured in our Wood Prairie Seed Piece issue of July 13, 2018 – was spotted by a Game Cam one night at 9:26 pm, a few weeks ago. Raccoons are our most common corn culprit. Two low strands of hot electric fence wire helps but doesn’t fully solve this annual cat-and-mouse game with corn-loving raccoons. Kinney Road Northern Leopard Frog. We found this fearless and motionless green Northern Leopard frog one mid-day last week enjoying the sun-warmed gravel on Kinney Road. He was positioned almost smack dab in the middle of the road and had no desire to be anywhere else. With Winter on the way, who could blame this frog for his decision to seize the day? Pulse ingredients together in food processor or mix by hand, cutting in the butter. Drizzle cold water and mix until dough comes together. Wrap in plastic and refrigerate while preparing tomato filling. Heat a large skillet over medium heat to saute' the onions and a couple pinches of salt in the oil. Cook, stirring regularly, until the onions are deeply golden and caramelized, 10-15 minutes. Remove from heat. While the onions are cooking, cut any larger tomatoes in half and leave the smaller ones whole. Add tomatoes to the caramelized onions along with the sea salt and balsamic vinegar. Transfer to a deep pie dish. If you get the sense that the tomatoes are quite juicy and might release a lot of liquid, you can toss the mixture with a tablespoon or two of flour at this point. Sprinkle mixture with lemon zest. Roll out the pie dough, and use it to cover the tomato mixture, tucking in the sides a bit. Cut a few slits in the crust and bake in the top third of the oven until the crust is deeply golden and the tomatoes are bubbling a bit at the sides, 25-30 minutes. Tomato Tarte Tatin. Late Season Treat.